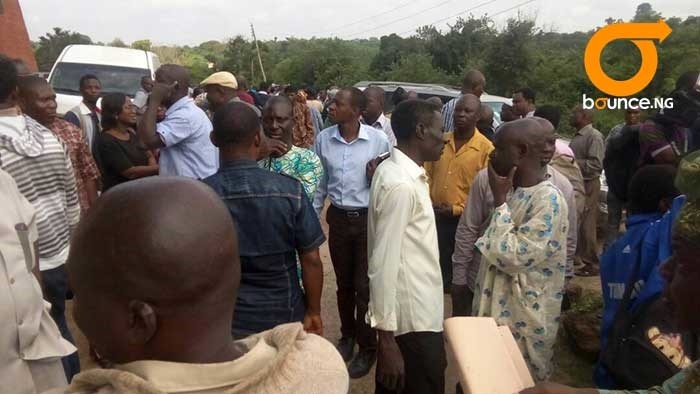 OAU students together with the staff did everything possible to prevent the prison and EFCC officials from taking their former VC to Ilesha Prison. Talk of the power of unity and you are talking about the staff and students of Obafemi Awolowo University. Earlier in the day, there was pandemonium in Osun State High Court Ede over the court’s refusal to grant bail to former Acting Vice Chancellor of Obafemi Awolowo University, Ile-Ife, Prof. Anthony Elujoba. Professor Anthony Elujoba is standing trial for alleged financial misappropriation during his short tenure but the staff and student union believe he is innocent. Known for their strong culture of unionsim, the OAU students together with the staff did everything possible to prevent the prison and EFCC officials from taking the accused persons to the Ilesha Prison. From deflating the tyres of their vehicles, to locking the judge, lawyers and every other person within the court premises inside, they stood together. The agitators who had defied heavy presence of security operatives in the court grounded every activity in the area, leaving commuters plying the road stranded for the hours the agitation lasted. After several hours of agitation by students and staff of the institution, the Judge, Justice David Oladimeji reversed his order to remand the defendant at the Ilesha Prison. Professor Elujoba and the bursar of the school, Mrs Ronke Akeredolu are now to be further remanded in the Economic and Financial Crime Commission (EFCC) custody, where they have been since last Wednesday. Justice Oladimeji also ordered that the ruling on the bail application earlier scheduled to hold next Wednesday July 19, be brought forward to Friday, July 15.